Greenway Park, Gay Lea Wilson, Vern Willey, and a collection of residential trails provides Altoona cyclists with fun options for getting around town. Flat asphalt trails are in great condition and at a comfortable width. A protected pedestrian bridge over 8th street is a safe option for crossing four lanes of busy roadway. Altoona’s trails are a fun and safe place for kids to ride. There are spots to visit along the trail such as the public library, city ponds, gardens, and recreation complexes. The Greenway Park Trail winds it's way northeast past ponds and quiet backyards. 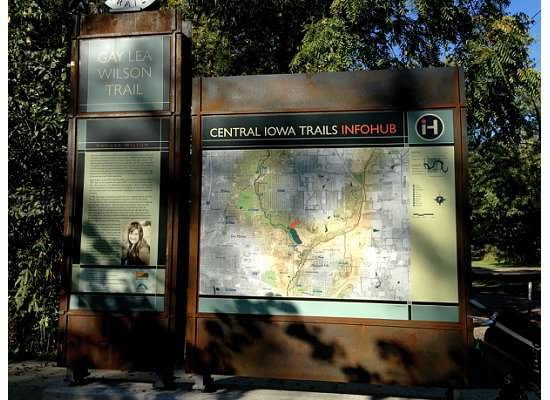 Named after the Altoona community services director and avid cyclist, the Vern Willey trail travels east/west through Prairie Heritage Park and connects to the popular Gay Lea Wilson Trail. I love riding around this Iowa town. Trails are in great condition and there's lots of options for a fun ride with or without kid(s). This ride was "with kid". Using the public library as our trailhead, we meandered around parks and neighborhoods. Our adventure included an inaugural visit to the Enabling Gardens. What a glorious garden! Along with the beautiful display beds, there's plenty of treasures tucked among the plantings. This a must-see spot in Altoona, even if you don't have a green thumb! Altoona is not only a fun community for a leisurely bike ride, it's a good place for young anglers to cast their line into one of the small ponds. Something tells me the kid I was with will be doing that on our next visit. After exploring around town we headed towards Pleasant HIll on the Gay Lea Wilson. The stretch between Altoona and NE 27th street is flat and mostly shady. A great segment for young riders on a sunny summer day. Greenway Park, Gay Lea Wilson, Vern Willey, and a collection of residential trails provides Altoona cyclists with fun options for getting around town. Flat asphalt trails are in great condition and at a comfortable width. A protected pedestrian bridge over 8th street is a safe option for crossing four lanes of busy roadway. Altoona’s trails would be a fun and safe place for kids to ride. There are spots to visit along the trail such as the public library, city ponds, and recreation complexes. During winter months I prefer Urban rides so I can stay sheltered from the frosty Iowa winds and ride trails cleared of snow. Winter bike rides also tend to be on the shorter side, so riding “in town” is the perfect location. Arriving in Altoona I used the dog park on NE 64th Street as my starting point. My plan was to ride a loop through town by first exploring the Greenway Park Trail, then the eastern portion of the Gay Lea Wilson and then hook back into the Vern Willey via residential paths. Information on Altoona's historical figures and events are posted intermittently along trails providing visitors like me a way to familiarize themselves with the community. In Greenway Park I learned I was riding on a former stage coach route. A plaque commemorated the route and told the story of how a harsh Iowa blizzard held the state's coffers hostage. After checking out the Greenway Park Trail I made my way back to the Gay Lea Wilson Trail. It travels in between train tracks and stands of pine trees before passing by Altoona’s original downtown area. Note: Google Maps incorrectly lists this portion of trail as the Vern Willey Trail. This was the first time I had explored Altoona by bicycle and came across several sightings I didn’t expect. The first was the A7D Jet displayed on the southern edge of the Sam Wise Youth Sports Complex. Next was the 11 foot tall sculpture Moai Dude by John Brommel Located in Ironwood Park. Hundreds of geese and ducks in Prairie Heritage Park along with the cycling themed bike rack outside the public library were also a delightful surprise. For some, Altoona likely isn’t top of mind when contemplating where to go for a bike ride, but it should be. This community has done a fantastic job creating a network of trails that are easy to explore with lots of fun things to see along the way. I broke this ride up into two segments using Copper Creek Lake Park in Pleasant Hill as my starting points. The park has some really nice facilities. There is a path circling the lake where fishing is allowed. A shady picnic areas, clean bathrooms and a fun playground area are all located on the northeast side of the lake. An InfoHub displays maps and information about Gay Lea Wilson. The asphalt trail has combinations of heavy to light tree canopy along with open areas. The trail traveling into Des Moines is very flat, while the portion towards Altoona is punctuated with short hills. Fun for coasting! Even though you’re in the metro I had opportunities to get in touch with nature. On this beautiful fall day there were lots of colorful trees to admire, ducks to watch at the lake, and countless birds and squirrels along the paths. The section towards Altoona was noisy as it travels alongside Highway 65. 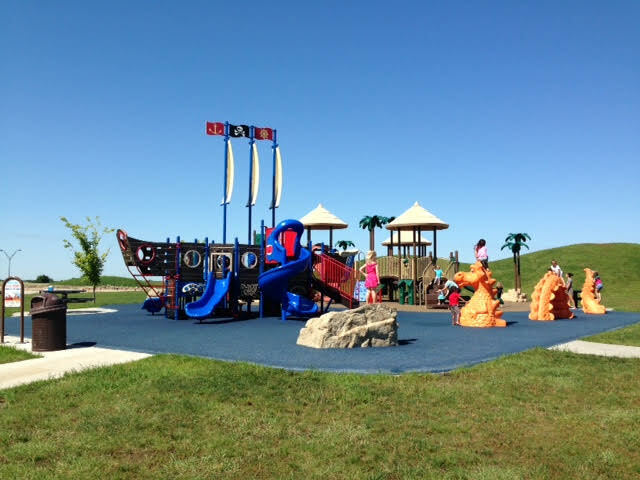 Sargent Park is Des Moines first natural playscape. This park doesn’t have your typical plastic equipment. Instead they have incorporated large boulders, hollowed trees,and bridges made rope. There’s even a cave to check out! 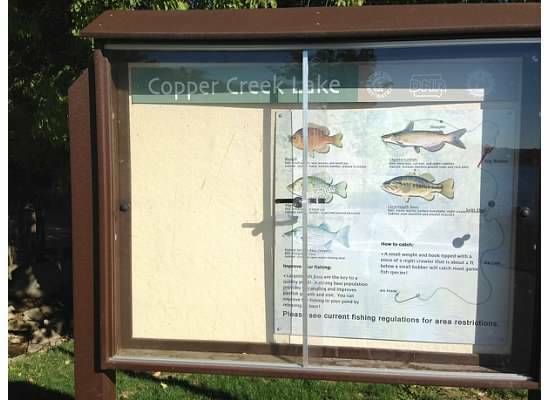 Copper Creek Lake Park - A short stop for water, a bathroom break and a quick snack before heading out towards Altoona. 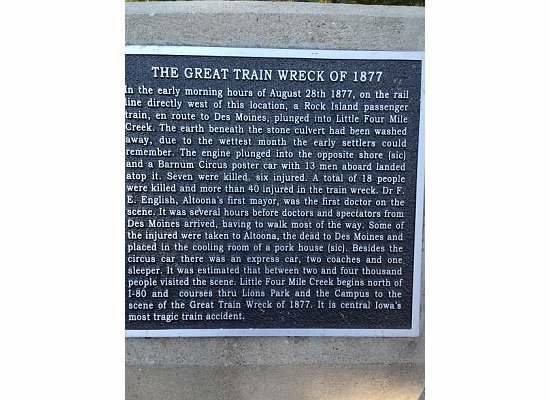 On the route to Altoona I passed the location of the worst train crash in central Iowa’s history. It took place way back in 1877 and involved a flood and a circus train. There’s a plaque that tells the story and marks this tragic event. I brought along homemade trail mix of almonds, dates and sunflower seeds to snack on while taking a quick break. After finishing my ride I made my way to Over the Top. 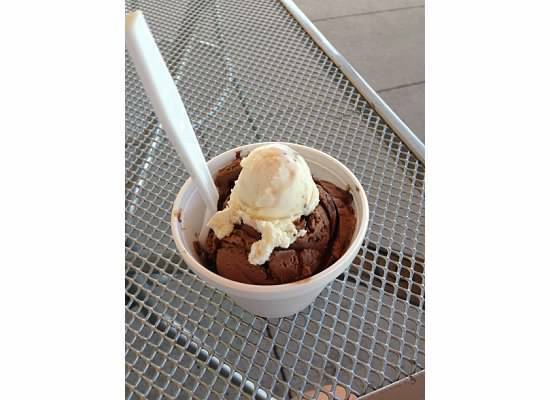 It is an amazing ice cream shop located about a mile east of the park off of University at 955 NE 56th St. All their ice cream is homemade. After much deliberating I chose Knee Deep in Chocolate and for my free “baby scoop”, Sweet’n Salty Pretzel. Since it was such a beautiful day I took my treat out to their patio to enjoy. Their name does them justice. It was over the top! Work has been underway to connect Ankeny to Pleasant Hill via the Gay Lea Wilson trail. After hearing rumors the trail was open for business, I decided to go find out if it was true. Turns out I was a week early. Since there isn’t an official trail head where the trail begins in Ankeny off of the 400 block of SE Oralabor road, I used the parking lot at Sportsmans Warehouse. The trail starts off as asphalt but changes to concrete where the trail has been extended. The new trail is wide and smooth with well groomed shoulders. This trail link includes some significant grades along with a few curvy spots alongside and I-80. Other than the short distance of wooded area traveling south from Oralabor there is no tree canopy. Despite it visibly continuing on towards Pleasant Hill, the trail was designated as closed in Berwick at the corner of NE 29th and NE 54th Ave. As tempting as it was to pedal past the orange barricade and continue my ride, I followed the rules and headed back towards Ankeny. 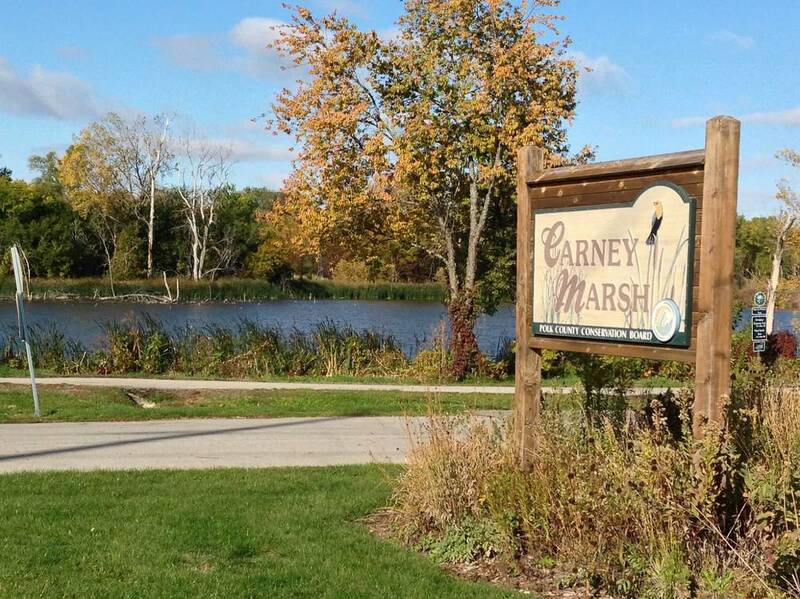 The only convenient location for stopping for a break was the Carney Marsh area. However, since it’s only a mile from where the trail begins in Ankeny I didn’t really need to to stop to rest. Watch out for traffic when crossing NE 66th and also SE Delaware. This trail segment is a good one for getting a biking workout in. The long inclines left me huffing and puffing but were spaced out well enough for some good recovery time. Since the majority of this trail segment is out in the open be prepared for sun or wind depending on what Mother Nature might be serving up. Today was a lesson learned as I returned home to find information online about the trail opening on October 30th. Next time I’ll check the internet for updates before I head out on a the trail! I took a short stop at Carney Marsh to check out the view and warm up my frosty fingers. About a mile into the ride you’ll find Carney Marsh It was a quiet day on the marsh. With the weather turning colder and many birds having begun their migration south I wasn’t surprised by not being able to spot any wildlife. I will have to keep this trail in mind when it’s birding season as the marsh is a popular spot for getting good views of heron and other water birds. The remainder of this ride travels through industrial areas. Views include lots of warehouse buildings and huge power lines. Boy was I cold when I returned to the car! Thankfully Caribou coffee was right next door. I got a hot latte to enjoy with my homemade muffin and a Honeycrisp apple.